Over the past few months, I was busy writing articles for different magazines and newspapers. This is one of them: Don’t bring me the food that western people love! This is part of a series of articles on food in the context of global development. All the articles are really interesting. It will give you a different perspective on some key issues. But not only this, there is more. We have seen in the previous blog that the children who are suffering from stunting (short stature) may look normal but the consequences of becoming and remaining stunted can be detrimental. In fact, we can observe an increased risk of morbidity and mortality, but also delays in cognitive (ability to think and understand) and physical development, which result in a decreased ability to learn and capacity to work. In fact, stunted height (and not underweight) is a dreadful marker of multiple deprivations regarding food intake, care and play, clean water, good sanitation and health care. It is an important indicator of child well-being – not only physical growth but also cognitive and socio-emotional development. What is the optimum age for promotion of growth for enhanced survival and human capital? Will this promotion necessarily lead to an increase in cardio-metabolic disease later in life? These aspects have their importance knowing that a lot of feeding programs in developing countries are aimed at older children, at a time where optimal linear growth is already compromise. For example, traditional school feeding programs that increase BMI with little eﬀect on height might be doing more harm than good in terms of future health. According to a study published in Lancet last month (see reference below), patterns already observed in the Western world are starting to be seen in low- and middle-income countries: i.e. putting on too much weight in relation to height in middle and late childhood (after 2 years old) can increase the risk for chronic diseases, such as diabetes, in later life. This scientific analysis that involved five prospective birth cohort studies from Brazil, Guatemala, India, the Philippines, and South Africa showed that it is important to focus on improved nutrition in the first few years of life, i.e. the 1,000 days from the start of a woman’s pregnancy until her child’s 2nd birthday. This study shows the importance to promote nutrition and linear growth during the ﬁrst 1,000 days of life (from conception to age 2 years), and also reinforces the importance of prevention of rapid relative weight gain after age 2 years. These ﬁndings have implications for present practices in low-income and middle-income countries, particularly emphasizing the need to monitor linear growth as well as weight, and to avoid promotion of excess weight gain in children older than 2 years. Optimum growth patterns in early life are likely to lead to less undernutrition, increased human capital, and reduced risks of obesity and non-communicable diseases, thus addressing both components of the double burden of nutrition. According to one of the authors, Dr Fall: “One of the challenges we are facing is the fact that we need to find ways to get very small children to be taller, and we don’t really know how to do it“. More work is needed on imaginative interventions to specifically promote height growth, instead of weight gain. These could include exclusive breast-feeding, long-chain polyunsaturated fatty acids like DHA, high-quality protein, and micronutrients. Mortality and undernutrition are falling substantially in most parts of the world, except for Sub-Saharan Africa, and new targets are being formulated to replace the present set of 2015 MDGs. A new goal for optimum linear growth that is expressed as a reduction in stunting can replace the present target of a reduction in underweight alone, which is one of the indicators for the ﬁrst MDGs towards the eradication of extreme poverty. This new target can be associated with the assessment of developmental functioning using a set of indicators based on the Psychomotor Development Index (PDI) and Mental Development Index (MDI) of the Bayley Scales of Infant Development. This integrated approach will help to evaluate appropriately physical as well as cognitive and socio-emotional development, which is so important when building human capital. This is an interesting article published by the UN news Centre…. and I would like to share with you some of the key points and highlight why quinoa is an interesting staple in the global context of food security. However, quinoa’s success starts to initiate problems and challenges that need to be addressed if we want to make this food revolution sustainable locally as well as globally. Quinoa, a highly nutritious grain-like crop that has made its entry into the food basket of culinary connoisseurs has been a staple for centuries in South America, among pre-Columbian Andean farming communities from Colombia to Ecuador. In fact, most of the world’s quinoa is grown on the altiplano, a vast, cold, windswept, and barren 14,000-foot Andean plateau spanning parts of Peru and Bolivia. 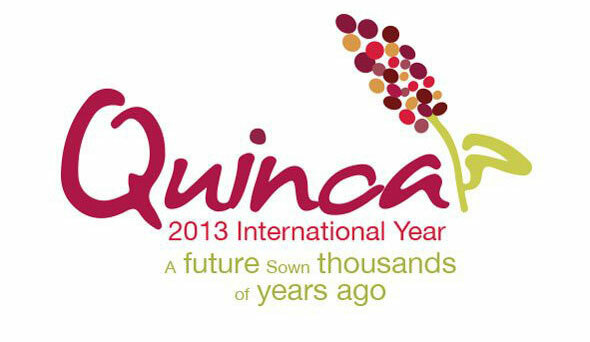 By declaring 2013 the ‘International Year of Quinoa’, the United Nations is hoping to popularize a life-sustaining seed that could help promote food security and poverty eradication, cut malnutrition and boost biodiversity in support of the achievement of the Millennium Development Goals. It is also a way to recognize the indigenous peoples who preserved quinoa through traditional knowledge and practices passed down through the ages. Cautioning that the crop is “still in the experimental phase” in some areas, Mr. Bojanic, who is the Deputy Regional Representative at the FAO Regional Latin America and the Caribbean Office and also serves as the Secretary for the International Year of Quinoa’s Secretariat, said that quinoa “is beginning to be taken up by countries that would not have thought of having it a few years ago.” Those include Canada, China, Denmark, Italy, India, Kenya, Morocco and the Netherlands, which are already producing or undertaking agronomic trials towards commercial production of quinoa. Bolivia and Peru account for more than half of the annual 70,000 tons produced of quinoa, with the United States responsible for about 7,000 tons and France close behind, FAO reports. Quinoa is hardy. It thrives in temperatures from -8 degrees Celsius to 38 degrees Celsius, at sea level or 4,000 metres above, and is not impacted by droughts or poor soils. “This crop can be grown under very difficult conditions like semi-arid, at high altitudes, sea level, with no fertilizer. It’s an amazing crop in terms of the adaptability that it has to stressful environments,” Mr. Bojanic said. This adaptability makes quinoa potentially viable for areas with regular droughts, such as the Sahel Region – which includes Senegal, Chad, Niger and Mauritania – where million of people are in need of emergency food aid and malnutrition is rampant. The latest figures in FAO’s State of Food Insecurity in the World 2012 Report show that despite significant progress, almost 870 million people – or one in eight – are still suffering from chronic malnutrition. UN officials say there is still time to reach the Millennium Development Goal for reducing the proportion of hungry people around the world by half by 2015, but countries need to step up their efforts and quinoa offers hope. Agronomical and nutritional attributes aside, quinoa’s global success relies on making it affordable. Consumers will not buy what they cannot afford, and farmers will not grow large quantities of a crop that is not financially viable. Such is the so-called quinoa quandary that as the demand for quinoa has grown in recent years, so has its price. Less than $70 per ton a decade ago, quinoa now sells for more than $2,000, according to FAO figures. In Bolivia, quinoa farmers near Lake Titicaca, the world’s highest body of water, carry waist-high stalks covered with purple, yellow, green and orange flowers to harvest. This is considered the cradle of great civilizations for the Tiahuanaco and the Incas, and is the origin of quinoa. “Now people everywhere are buying quinoa. In La Paz, they sell it in the markets. It’s everywhere. For that reason we are also able to sell small quantities. With that money we sustain our families,” Elias Vargas, a farmer, told the United Nations. Mr. Vargas and his neighbours sell their crops to a Bolivian coffee chain, Alexander Coffee, which uses quinoa in its salads, sandwiches and desserts. The company bakery turns out more than 1,000 quinoa chocolate chip cookies per day. The partnership between small farmers and small businesses is part of a project supported by the UN’s International Fund for Agricultural Development (IFAD). While farmers like Mr. Vargas do not grow enough to sell to foreign markets, increased domestic consumption provides them with new opportunities. Almost all of the estimated 250,000 acres of quinoa farmland is in the hands of small farmers and associations around the world. FAO estimates that at least 130,000 small quinoa growers from South America alone will benefit this year from increased sales, higher prices for their crops and a return to indigenous practices in a sustainable manner. “In the traditional markets, it is still rather accessible to poor people but when you find it in the supermarket it tends to be rather expensive,” Mr. Bojanic said. The rapid expansion of quinoa farming in the last years has been a double-edged sword. As prices rise, farmers are more likely to sell the quinoa crops they would have consumed, sparking concerns of malnutrition. About one-third of children under the age of five in the Andean countries are already chronically malnourished, according to figures from the World Health Organization (WHO). The change in food choices as a result of higher income is also causing some farmers to turn from traditional staples to more caloric, processed foods. The change is particular among youth who would prefer a sugary soda to a home-made drink of boiled water, sugar and quinoa flour. In addition, the increased incentives to produce more quinoa are also contributing to land disputes. “Land that had barely any use in the past and small farmers who were not in conflict are starting to – now that the land has more value – struggle among themselves so they can claim such lands to produce quinoa,” Mr. Bojanic said. Property disputes are further aggravated by reverse migration, as the high prices for quinoa are motivating residents who moved to cities to return to plots, and by not giving the soil enough time to rest between harvests. The push for increased production is seemingly at odds with the traditional life of the quinoa farmers, a main reason quinoa was selected for the honour. But UN officials stress that boosting the importance of developing sustainable production systems for quinoa consumption and food security are among the main objectives for the year. The International Year of Quinoa, is overseen by the IYQ- International Coordination Committee composed of the ministries of agriculture of Andean countries and France. Bolivia has the presidency of the Committee, with Ecuador, Peru and Chile sharing the vice-presidency. In the public sector, the UN is looking to engage with international agricultural research centres and national research centres on a global research network and gene bank database to maintain the crop’s 120 variations. The idea is that experts will test the crops and show farmers how they can best be grown under different conditions. Professor Luz Gomez Pando is one of the local experts and scholars working with the UN in Lima, Peru. Based at La Molina University, she uses nuclear radiation to develop new varieties of quinoa that have a higher yield. The gamma rays speed up the evolution process that would take millions of years in nature. She then gives her seeds to the women farmers and at harvest time, cooks quinoa with them. The majority of quinoa is produced using traditional technologies that result in low yields. A hectare normally results in 600 kg of quinoa. FAO wants to raise the production to a ton of quinoa per hectare. That would help raise the overall production from 70,000 tons per year to 200,000 tones annually by 2018 through improved technologies and engagement with businesses already processing quinoa, including large importers and exporters. Undernitrition – where are we in 2013? 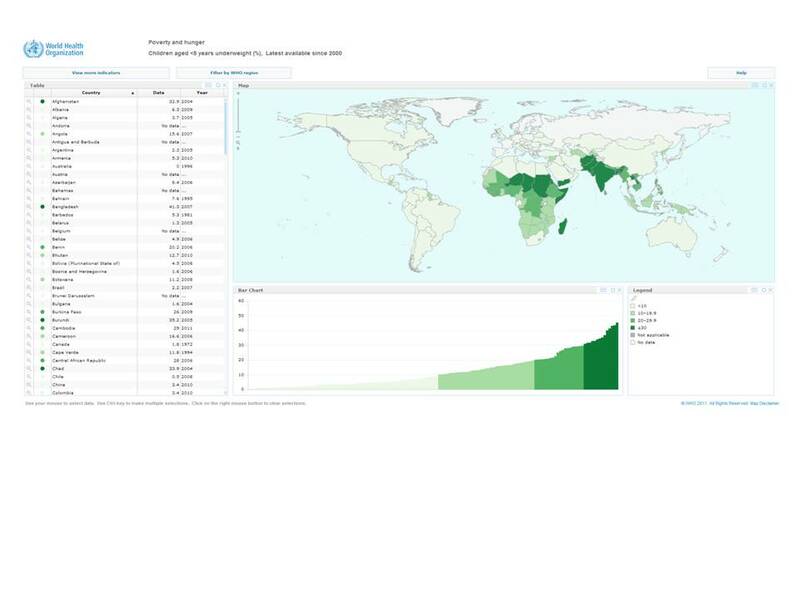 Undernutrition affects millions of people each year all over the world, although the main concentration of cases is found in Sub-Saharan Africa and Asia (see figure below). 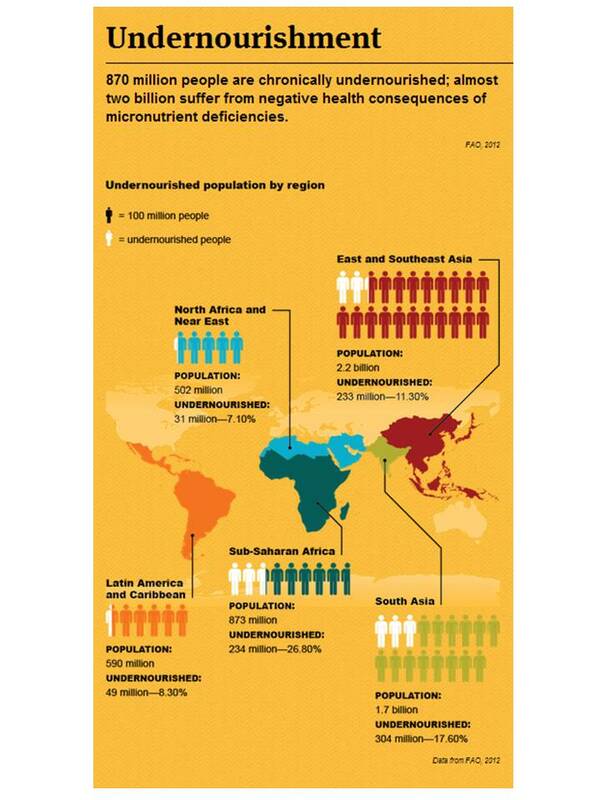 870 million people are undernourished in the world today. That means one in eight people do not get enough food to be healthy and lead an active life. Hunger and malnutrition are in fact the number one risk to the health worldwide — greater than AIDS, malaria and tuberculosis combined. It is recognized as the underlying cause of nearly a third of deaths from all diseases in children in pre-school years. In fact, maternal and child undernutrition account for 11 % of the global burden of disease. Severe and moderate forms of acute malnutrition (leading to wasting) are indicated by a low weight-for-height or presence of bilateral oedemas. This occurs as a result of recent rapid weight loss, or a failure to gain weight within a reasonably short period of time. Wasting occurs more frequently with infants and young children, often during the stages where complementary foods are being introduced to their diets (6 to 24 months), and when children are typically more susceptible to infectious diseases. Acute malnutrition can result from food shortages, a recent bout of illness, inappropriate child care or feeding practices or a combination of these factors. According to Action Against Hunger, It is estimated that around 41 million children globally have moderate acute malnutrition (MAM). Most children with MAM live in southern Asia and sub-Saharan Africa. Furthermore, it is suggested that there are potentially 20 million children suffering from severe acute malnutrition (SAM) every year, and an estimated 0.5 million to 2 million children with SAM die each year, depending on the type of reporting mechanism. 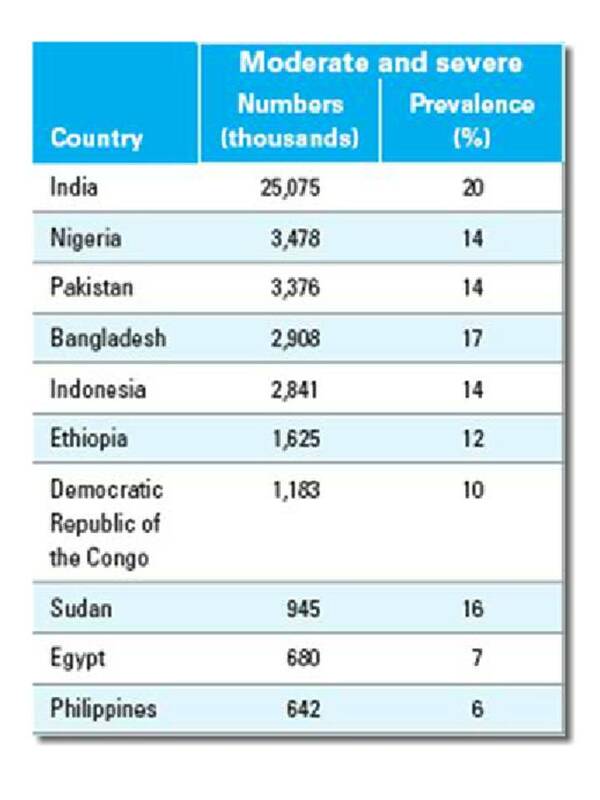 Sixty percent of all the wasted children (both moderate and severe) in the world live in ten countries (see table below); India being the more affected with ~25 million children suffering of moderate and/or severe acute malnutrition. Stunting or chronic undernutrition, resulting in growth retardation, is indicated by a low height for-age. The causes and etiology of stunting include nutrition, infection and mother-infant interaction. Stunting is a cumulative process that can begin in utero and continue until the age of 3 years after birth, compromising the growth of a child. The consequences of becoming and remaining stunted are increased risk of morbidity, mortality, delays in motor and mental development, and decreased work capacity. Stunting is estimated by the UNICEF to affect 800 million people worldwide. 195 million children under 5 years of ages are stunted. The prevalence of stunting is highest in Africa (40%), and the largest number of stunted children is in Asia (112 million), mostly in South-central Asia (India). 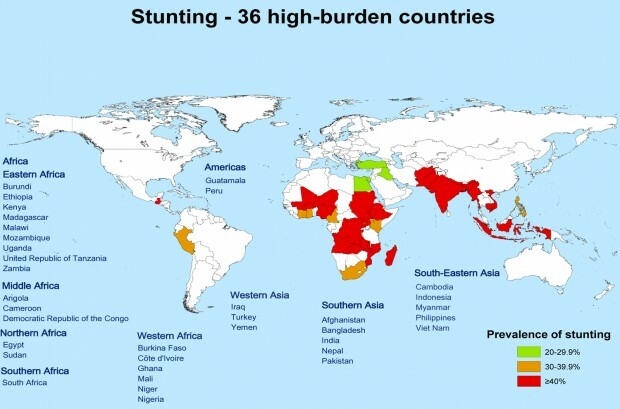 Ninety per cent of the overall global burden of child stunting is attributable to 36 countries (see figure below). Underweight is a composite measure of both acute and chronic malnutrition, indicated by a low weight-for-age. 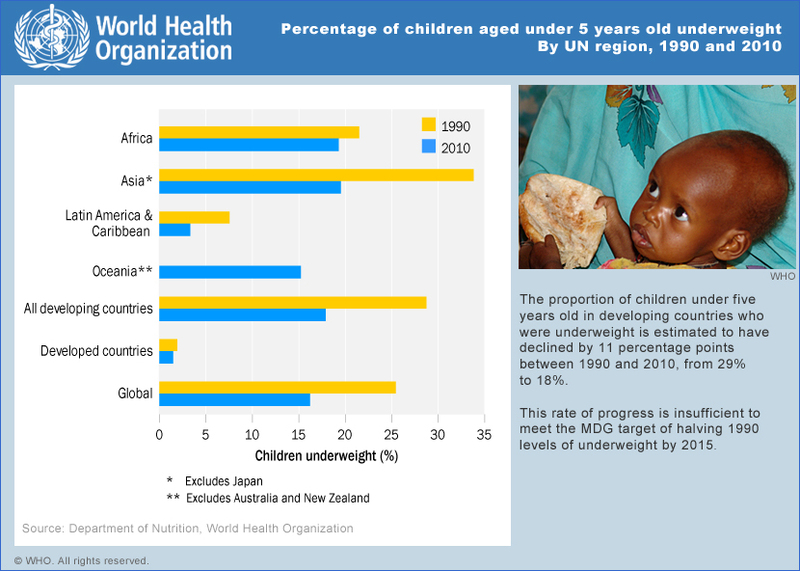 In 2011, an estimated 17%, or 99 million children under five years of age in developing countries were underweight. As shown in the figure above, underweight is most common in South-central Asia (30%), followed by Western, Eastern, and Middle Africa (22%, 19% and 17%, respectively) and South-Eastern Asia (17%). The situation is better in Eastern and Western Asia, Northern Africa and Latin America and the Caribbean, where less than 10% of children were underweight. 1) Children in the poorest households are twice as likely to be underweight as those in the least poor households. 2) Children living in rural areas are more likely to be underweight than those living in urban areas. The proportion of children under five years old in developing countries who were underweight has declined by 11 percentage points between 1990 and 2011, from 28% to 17% (see figure below). During this period of time, good progress has been made in Western Asia (reduction from 14% to 5%), Eastern Asia (reduction from 15% to 3%), Caribbean (reduction from 9% to 4%), Central America (reduction from 11% to 4%) and South America (reduction from 6% to 3%). In South-eastern Asia, underweight has declined but remains high at 17%. In contrast, underweight continues to be very high in South-central Asia (30%). This combined with large population, means that most underweight children live in South-central Asia (56 million in 2011). Actually, India has the second higher % of children aged <5 years that are underweighed (43.5%). Finally, as shown in the figure below, progress is still insufficient in Africa. One interesting point is the fact that we don’t know yet if rising food prices and the current economic crisis have affected the latest trends in some populations, it is too early to draw firm conclusions. Micronutrient deficiencies occur when the body does not have sufficient amounts of vitamins or minerals due to insufficient dietary intake and/or insufficient absorption and/or suboptimal utilization of the vitamins or minerals by the body. One out of 3 people (2 billion people) worldwide are affected by vitamin and mineral deficiencies, according to the WHO. An estimated 250 million preschool children are vitamin A deficient. An estimated 250,000 to 500 000 vitamin A-deficient children become blind every year, half of them dying within 12 months of losing their sight. Moreover, in vitamin A deficient areas, it is likely that a substantial proportion of pregnant women is vitamin A deficient. Iron deficiency is a principal cause of anemia. Two billion people—over 30% of the world’s population—are anemic. For children, health consequences include premature birth, low birth weight, infections, and elevated risk of death. For pregnant women, anemia contributes to 20% of all maternal deaths. 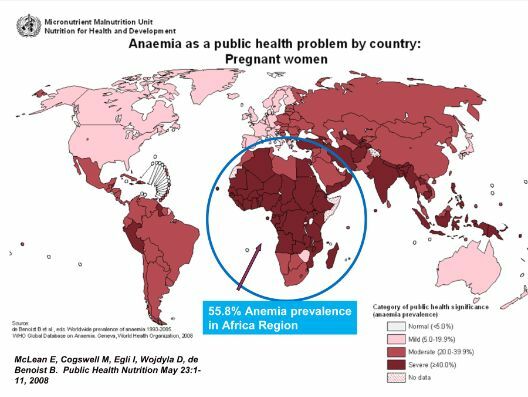 In many countries, more than half of all women of reproductive age are anemic (see figure below). Iodine deficiency disorders (IDD) put at risk children´s mental health– often their very lives. 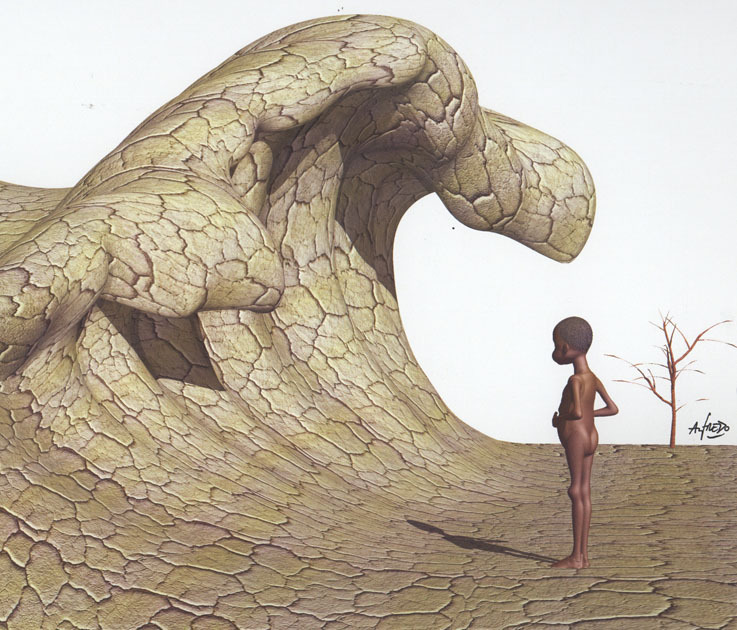 Serious iodine deficiency during pregnancy may result in stillbirths, abortions and congenital abnormalities such as cretinism, a grave, irreversible form of mental retardation that affects people living in iodine-deficient areas of Africa and Asia. IDD affects over 740 million people, 13% of the world’s population. Fifty million people have some degree of mental impairment caused by IDD. The figure below shows the areas at high risk of micronutrient deficiency for iron, vitamin A and iodine in the developing world. 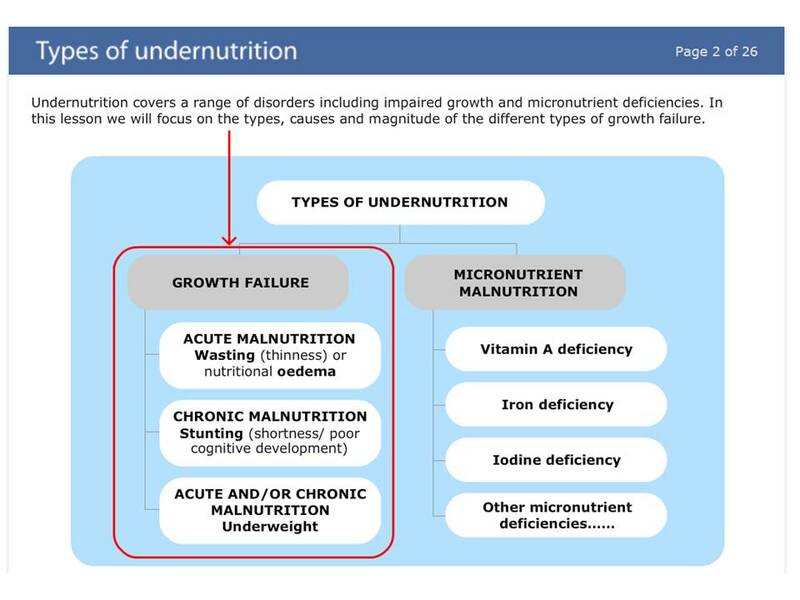 What is interesting to note is the fact that micronutrient deficiency affects a larger range of low and middle-income countries, more than the problem of underweight and/or stunting (see figure above). Globally, the problem is enormous and needs a special attention. Maternal undernutrition, resulting in poor nutritional status of the mother during preconception, pregnancy and post-natal stages, is indicated by a low Body Mass Index (BMI) and micronutrient deficiencies. In nowadays, the prevalence of low body mass index (BMI <18.5 kg m-2) among women 15–49 years of age may be as high as 26.5% in Sub-Saharan Africa, 35% in South/Southeast Asia, 15.5% in Caribbean and 4% in Latin America. As shown in the figure below, India is again among the countries with the higher level of underweight women (> 20%). It is important to keep in mind that maternal short stature and low body mass index independently have adverse effects on pregnancy outcomes. It was really difficult to find a visual representation of the worldwide prevalence of underweight among women aged 20-49 years old. 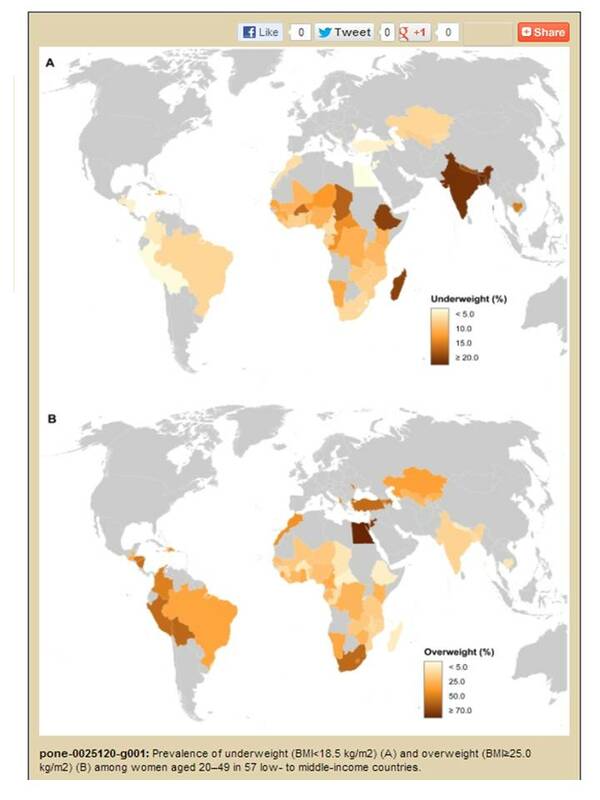 The map above shows both the prevalence of underweight and overweight in 57 low to middle income countries. What is quite interesting is the fact thatthe prevalence of overweight in young women residing in both urban and rural areas is higher than those in underweight women, especially in countries at higher levels of socioeconomic development. The best examples are Brazil and South Africa (the worse situation), the exception is India. Low birth weight (LBW) of newborn infants is defined as weighing less than 2,500 g at birth irrespective of gestational age (WHO). More common in developing than developed countries, a birth weight below 2,500 g contributes to a range of poor health outcomes like low fetal and neonatal mortality and morbidity, inhibited growth and cognitive development, and chronic diseases later in life. Birth weight is affected to a great extent by the mother’s own fetal growth and her diet from birth to pregnancy, and thus, her body composition at conception. More than 20 million infants worldwide, representing 15.5 %of all births are born with low birth weight, 95.6 % of them in developing countries. The level of low birth weight in developing countries (16.5 %) is more than double the level in developed regions (7 %). Half of all low birth weight babies are born in South-central Asia, where 27 % of all infants weigh less than 2,500 g at birth. Low birth weight levels in sub-Saharan Africa are around 15 %. Central and South America have, on average, much lower rates (10 %), while in the Caribbean the level is almost as high as in sub-Saharan Africa (14%). 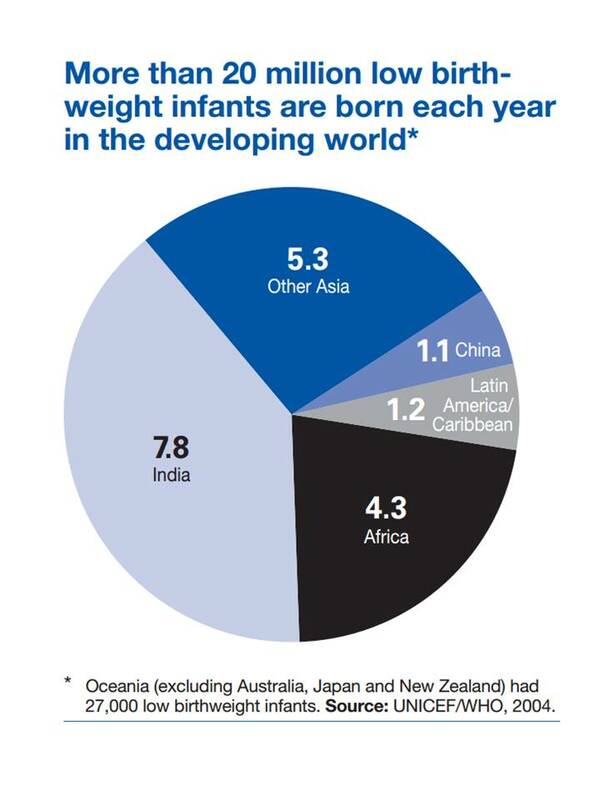 About 10 % of births in Oceania are low birth weight births. Interestingly, almost 70 % of all low birth weight births occur in Asia; mainly in India, which is also the country with the high prevalence of stunting. Food security programs are shifting their focus from quantity to quality, but what is the best approach? This is a great article … then we hope you will enjoy it. It highlights the importance to focus on quality (diversity in foods, indigenous staples…) and not anymore (or not only) on food quantity (calories) – A vision for program development shared by Challenged Kids International. 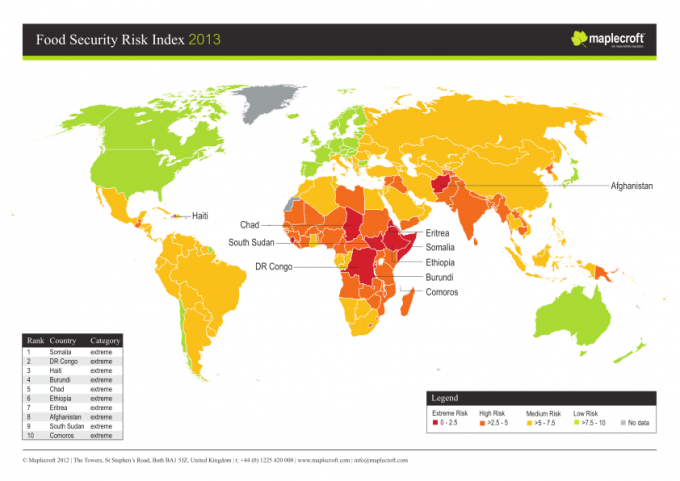 Food security and malnutrition remain some global development‘s biggest challenges. Latest UN figures show that 870 million people were chronically undernourished between 2010–12; the vast majority of whom, 850 million, live in developing countries. Yet despite this the UN’s Scaling Up Nutrition (SUN) movement said in it’s report that 2012 was the year “when chronic under-nutrition moved from the side-lines to the centre”. It argues that the international community has now realized the need to shift focus from simply food quantity, to one of food quality. In a word: nutrition. There are, however, differing views as to how best to increase nutrition levels. Monique Mikhail, policy adviser on sustainable agriculture at Oxfam, welcomes initiatives such as SUN, which has 28 developing country government members. But she and many others in the NGO community fear that international efforts to target government agricultural policies often result in more cereals to be sold as export, rather than the locally-produced diverse foods needed to improve nutrition. “A lot of the discourse out there is pushing this large-scale, mono-culture model, without realizing the impacts of that on communities”, says Mikhail. “Land is being taken away from small-scale producers.” The World Bank identifies five ‘pathways’ that link food production to nutrition: subsistence-oriented production, income-oriented production for sale in markets, increased agricultural production, empowerment of women to control household food and health, and macroeconomic growth. But in practice, one is favored over another. According to SUN, a 2005 Ethiopian health survey found that chronic malnutrition was highest in its most agriculturally productive regions. The inference was large-scale production can lead directly to export, or simply a lack of local food diversity. Mikhail also advises that development professionals look to small-scale farming when addressing malnutrition. “Small-scale livestock is also incredibly important. Consuming more meat, milk and protein contributes greatly to your overall nutritional status in a way that allows you to absorb vitamins from the other vegetable products,” he says. 1. Identify the scale and cause of undernutrition. Collect information about the magnitude of undernutrition, its causes and severity. Then identify and target the most vulnerable groups, especially pregnant mothers and children under two. 2. Assess food consumption patterns. Gain an understanding of what the community eats, where they obtain food, and the nutritional gaps. 3. Assess the level of government commitment. Look at the national nutrition strategy and policy framework and the level of current/planned budget to roll that out, including local representation and extension services. 4. Identify care and health practices. This includes informal care – mothers, siblings, fathers – as well as formal health care services in the area. 5. Promote biodiversity and sustainable agricultural practices. 6. Give women the means to empower themselves. 7. Promote the production and consumption of meat, dairy products and fish (where available). 8. Reach out through multiple channels. Home visits, agricultural extension services, nutrition counselling, women’s groups, dramas and storytelling. These could be combined with other essential health services such as immunization. This conclusion has received vast media coverage – announcing that this meta-analysis demonstrates clearly that organic foods might not have more nutritious value than conventional foods and questioning the “value add” of producing and eating organic. Is organic food little more than a made up marketing scheme, another way for affluent consumers to waste money? This was the kind of questions that came to my mind when reading the articles from influential newspapers like the New York Times and the Washington Post. In fact, there are major issues and gaps when reading both the scientific article as well as the media coverage. One of them is the simplistic way that the media has used to report on this study. They mainly focused on the conclusion that summarized two results as a key statement. However, when reading the article, each of us can appreciate all the results (or non-results) as well as the limitations of this study and can conclude that things in nutrition science are not so simple. The fact that the journalists have not done a critical analysis of the study and available scientific publications on the subject, or have not highlighted its limitations that are quite substantial or have not offered a fair presentation of what the study’s critics have to say is intriguing and disconcerting because a good scientific investigation can minimize the impact that this “single” study can have on our choice to eat or not organic foods. In fact, more clinical long-term investigations are needed to answer the question: “is organic food more nutritious or safer?” It will bring an important component – tangible outcomes to validate its real value in prevention and promotion. The challenges associated to scientific research of the benefice of eating organic foods will be discussed in another blog. This is a very hot topic and we would like in this blog to ask some pertinent questions and answer them, when possible. This will help to clarify why it is important to continue to develop organic farming as well as to eat and promote organic foods not only at the local but also at the global levels. What are the advantages of doing organic farming – locally and globally? There are many explanations and definitions for organic agriculture but all converge to state that it is a system that relies on ecosystem management rather than external agricultural inputs. 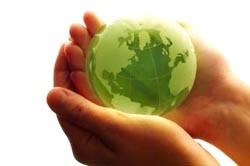 This is a system that begins to consider potential environmental and social impacts by eliminating the use of synthetic inputs, such as synthetic fertilizers and pesticides, veterinary drugs, genetically modified seeds and breeds, preservatives, additives and irradiation. These procedures are replaced with site-specific management practices that maintain and increase long-term soil fertility and prevent pest and diseases. When doing organic farming, a variety of crops and livestock are cultivated in order to optimize competition for nutrients and space between species. This results in less chance of low production or yield failure in all of these simultaneously. This diversity in production can have an important impact on local food security and resilience. In rain-fed systems, organic agriculture has demonstrated to outperform conventional agricultural systems under environmental stress conditions. Under the right circumstances, the market returns from organic agriculture can potentially contribute to local food security by increasing family incomes. Does global trade with organic products support a sustainable development? Can organic agriculture contribute to global food security? Does organic certification safeguard natural resources and improve working conditions? Can fair trade with organic products be realized? These questions need answers if we really want to impact the current and future food insecurity and demonstrate the viability of a sustainable global agriculture system based on organic farming. Because it is safe, nutritious as well as socially responsible and it allows us to reconnect with the essence of “good and tasty eating behaviors”! This is our vision at Challenged Kids International. The discussion of these different points comes next. Isn’t reducing exposure to pesticides and antibiotic use precisely what organic production is supposed to do? Today, agricultural contaminants such as inorganic fertilizers, herbicides and insecticides as well as hormones and antibiotics used in conventional agriculture are a major concern all over the world. These chemicals have accumulated up the food chain where top predators (e.g. humans) can consume toxic quantities. Organic agriculture restores the environmental balance and organic foods are far safer in terms of pesticide content, antibiotic-resistant bacteria and GMOs. And the Stanford University study corroborated partially this conclusion by finding that organic food had 30% less pesticide residue (see Wayne Roberts’ Blog for this specific point – http://blogs.worldwatch.org/nourishingtheplanet/citywatch-getting-to-the-right-question-on-the-nutrient-benefits-of-organic-food/). Even though the pesticide levels in conventional foods in this study fall within the safety guidelines set by different environmental protection agencies, it is important to note that the health effects of the pesticides are cumulative, and that what we would consider safe at one time point might not be anymore the same over a period of 20 to 40 years of accumulation. Moreover, the Stanford study also noted that the risk for ingesting antibiotic-resistant bacteria was 33% higher in conventional than in organic chicken and pork but did not discuss at all the potential health outcome of this kind of results. Why this result is so important? Let me take one recent example to show you the potential link between ingestion of antibiotic resistant bacteria, and clinical morbidity and mortality. As highlighted recently in the Huffington Post (as well as in other newspapers and magazines), superbugs (drug-resistant E. coli) in chickens could be an underlying cause of antibiotic-resistant bladder infections in 8 million women (http://www.huffingtonpost.com/2012/07/12/chicken-bladder-infection-superbug-uti_n_1668255.html). In fact, chickens are injected with antibiotics from day one to help them grow bigger and faster and protect them from diseases. The problem is that these are the same antibiotics sold in the U.S. for humans to treat bladder infections, among other conditions, which means our bodies eventually become resistant to the drugs because we’re getting so much of it. McGill University researchers who have published this interesting result, had previously reported that the E. coli in the chicken was much more genetically related to those of human urinary tract infections, compared with the E. coli in the beef and pork. An interesting but implacable demonstration! More importantly, from a public health safety point of view, this kind of results has led the USDA to routinely sterilize commercially harvested meat, a practice not necessary in organically raised animals. …. Yes, may be, perhaps…. It all depends on what you mean by nutritious food and its relation to seasonal food. This Stanford University study has also showed that organic foods may have higher levels of anti-oxidants – plant phytochemicals thought to be important to human health as well as omega-3 fatty acids in organic milk and chicken, and vaccenic acid (potential anticancer effect) in organic chicken. Evaluating the health benefits of eating organic foods is a relatively new research focus (less than 10 years of investigation). The number of publications is increasing significantly each year and we can expect more sophisticated research projects and as a result, more and more interesting results will be available to demonstrate the benefit of eating organic foods. Moreover, the long term health impact of eating organic foods is not currently appropriately addressed. The duration of the human studies ranged from two days to two years. Most of the health effects will take a lot longer than that to show up. According to the Stanford University article, this kind of clinical investigations won’t be possible because it is too expensive. Past (the SUVIMAX 1 study in France) and current experiences (the SUVIMAX 2 and Nutrinet studies in France, the Raine study in Australia and the Ontario Birth Study here in Toronto, Canada) to name some of them show that this is possible to investigate long-term effects if there is the political will to go in this direction. Finally, the interface between food, nutrition and health is a complex issue. It depends from where you come from, your education and how you value the importance of good foods and/or health as well as the tradition and culture around food and culinary practices. For CKi, nutritious food is more than the number of calories or the quantity of macro- (protein, carbohydrate…) and/or micronutrients (minerals and vitamins), it also relates to its social component (eating together, discussing and sharing food), the taste of food, the use of our five senses and finally, the impact that colorful and tasty foods can have on our brain and ultimately on our overall well-being. Nutrition is a complex phenomenon, like an interactive game where pleasure can play a significant role. Unfortunately, we have lost this dimension in our “super speed” world. A few years ago, I switched to organic and/or local food because I wanted to reconnect with my roots (French culture around food). The result has been more than positive. I have rediscovered the taste of foods: seasonal fruits and vegetables where I am sure to find the best nutritional value as well as locally produced meat, eggs, cheese and bread. As a result, I am eating less meat and refined carbohydrates but more grains, fruits and vegetables; I also cut completely junk foods. When I am cooking real foods and I am eating good cuisine, I have a lot of pleasure and I feel full not only in my stomach but also in my mind – a great sensation of satiety. I also know that I contribute socially to the sustainability of the global food security. This is also why it is important to eat organic and/or local foods! Over time, we can expect that unbiased analysis coupled with modern-day science is likely to show with increasing clarity that growing and consuming organic food, especially in conjunction with healthy diets rich in fresh, whole foods and seasonal fruits and vegetables is one of the best health-promotion investments we can make today as individuals, families, and a society. * In statistics, a meta-analysis refers to methods focused on contrasting and combining results from different studies, in the hope of identifying patterns among study results, sources of disagreement among those results, or other interesting relationships that may come to light in the context of multiple studies.